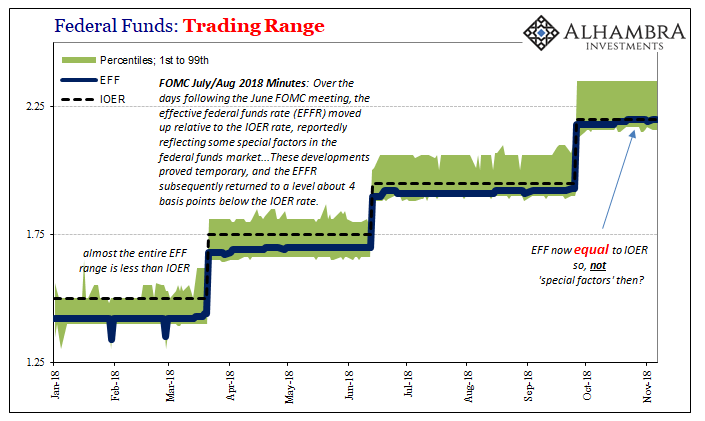 The effective federal funds (EFF) rate actually dipped 1 bp last Friday. Having spent the prior eight trading days equal to IOER at 2.20%, it might’ve been heartening for US central bankers under siege. After all, they adjusted that particular policy tool back in June and then in July said this whole EFF thing was due to “special factors” that had long since dissipated. People were starting to question whether they know what they are doing. This is one of the most frustrating aspects of all this. Even when the mainstream sees what’s wrong, they can’t ever really figure out why. Who cares if “reserves will become scarce”, that’s not what is plaguing the global system. The Fed is actually to blame for everyone blaming the Fed, feeding, as it has, this idea that it is central to the monetary system. To put it simply, if the US economy was actually booming, then why would scarce reserves matter? They hadn’t for decades before 2008 (and let’s not kid ourselves here, they haven’t matter one bit after). The Fed’s balance sheet was minimal and yet there hadn’t been any kind of monetary irregularities until August 9, 2007. In other words, the system creates its own reserves and if the economy was as good as advertised it would be doing that right now. 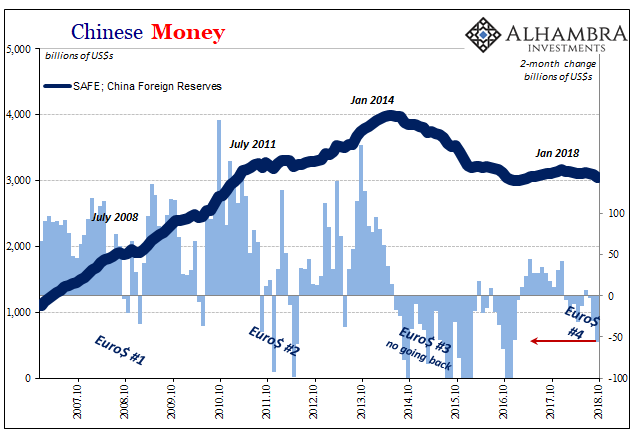 The pullback of the Fed’s balance sheet, this so-called quantitative tightening, wouldn’t matter because the private money system would’ve stepped in with its own forms. You know, what actually happened before. 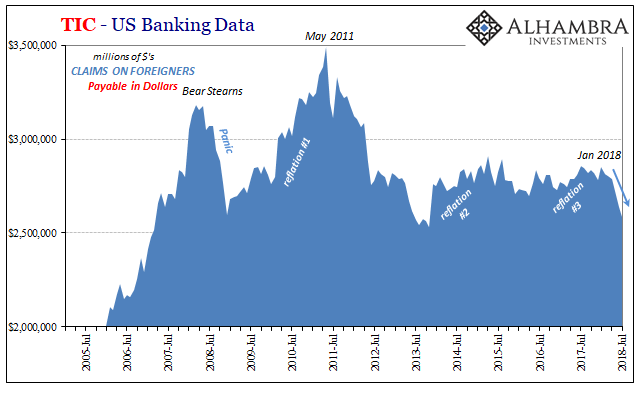 I can understand why it’s so puzzling to mainstream observers, who have all been taught since Economics 101 that bank reserves and the Federal Reserve are at the base of the monetary pyramid. That might’ve been true a very long time ago, but hasn’t been since at least the sixties. I centered my speech and presentation in Toronto in August around this very topic. 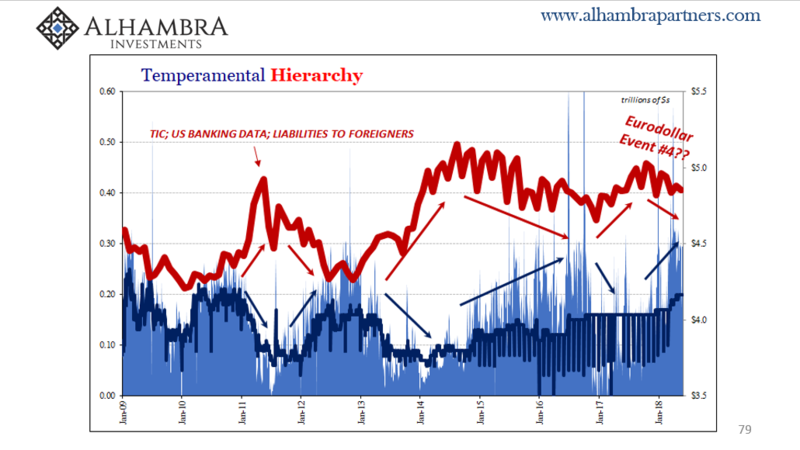 The behavior of EFF as well as a number of other money rates speaks to hierarchy; rather, the non-coincidental absence of it. But not just a random breakdown, there are clearly specific times when this kind of money market chaos shows up. 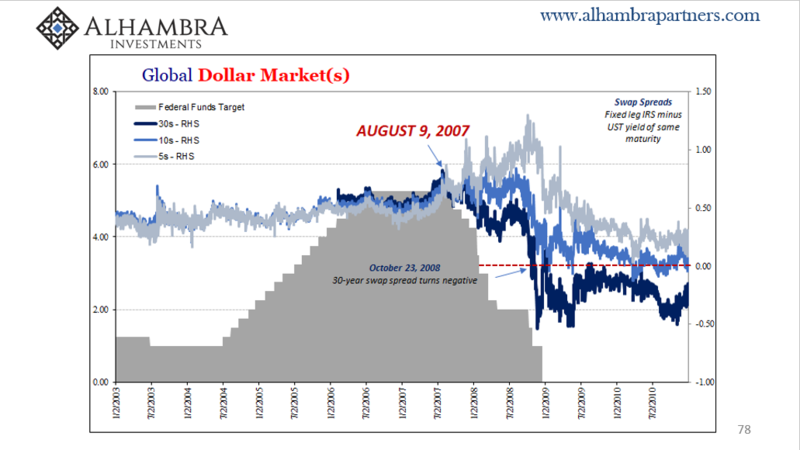 These are the eurodollar squeezes, or rising dollar periods. No, no, no. Again, if the economy was “on solid ground” the private banking system would be financing its own opportunities just as it used to. 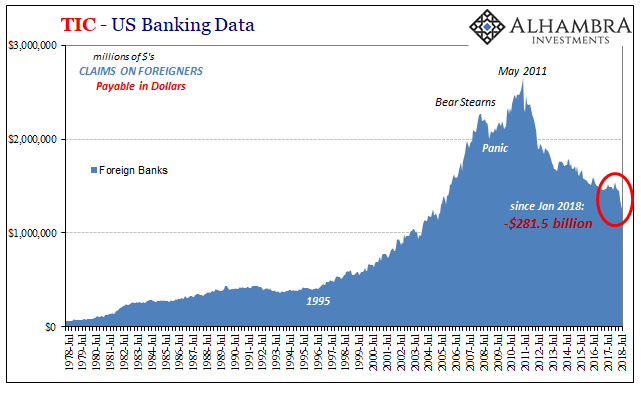 But since the economy never recovered because the Fed never “pumped trillions of dollars into the banking system to support the economy after the financial crisis” the banking system therefore monetary system engages in these intermittent spasms of deflationary tight money. 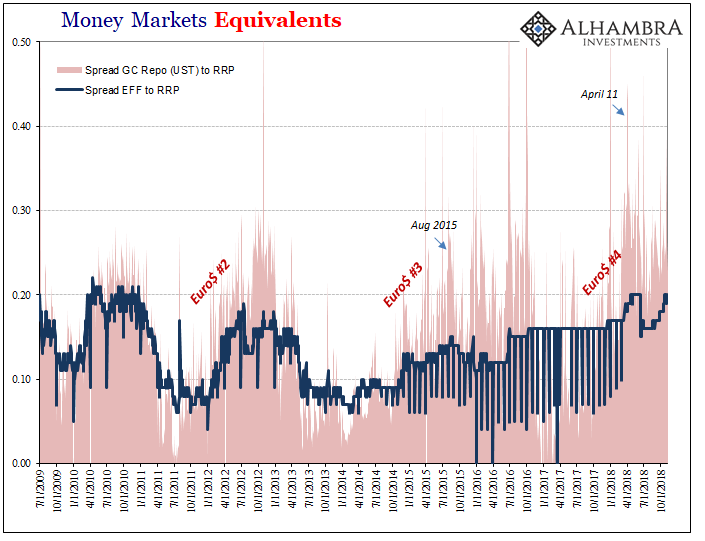 QE was never more than an ill-considered asset swap, and one that was likely more harmful than helpful. The symptoms are all around us right now (WTI contango almost $2 today). But if you believe what was written in the quote above, none of this makes any sense therefore it must be QT. 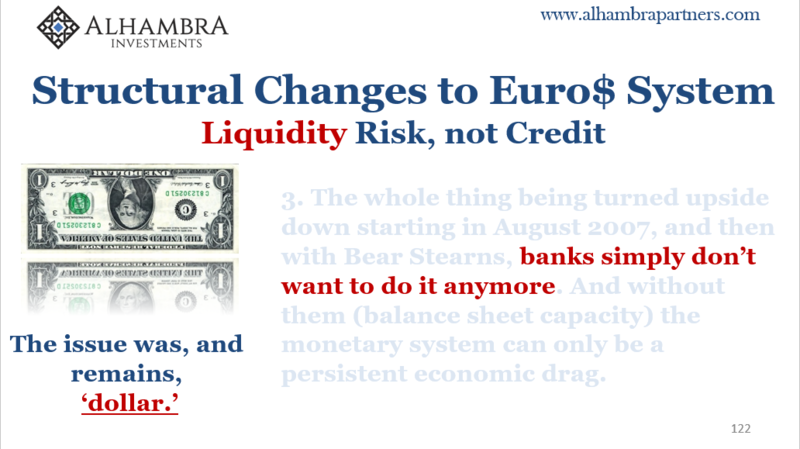 Money doesn’t get “sucked out” if everything is healthy, which is what QE was supposed to have accomplished. The contradiction couldn’t be more obvious. In reality, federal funds just don’t matter. The only reason anyone is paying attention is because this is a blatant violation, something that just isn’t supposed to happen.  What’s really happening is that things are getting so out of hand where they do matter, offshore eurodollars, just ask the desperate Chinese, it is actually being picked up in this one irrelevant place. And for once making the world pay attention to monetary policy incompetence. It’s not the first, nor has it been the most egregious. It is still fitting that the Federal Reserve operates its main monetary policy in this market. And now it can’t even get that right. One of these days, someone is going to start asking the right questions for once. Just maybe, after all that has happened the last eleven years, and every central banker excuse and dodge, central banks just aren’t central at all. Until then, ridiculous frustration and contradictions. And the global monetary system contracts, knocking the global economy down with it, for a fourth not a first time.